When Kenny Dalglish sloped off to Liverpool in August 1977 he left a considerable void to fill. 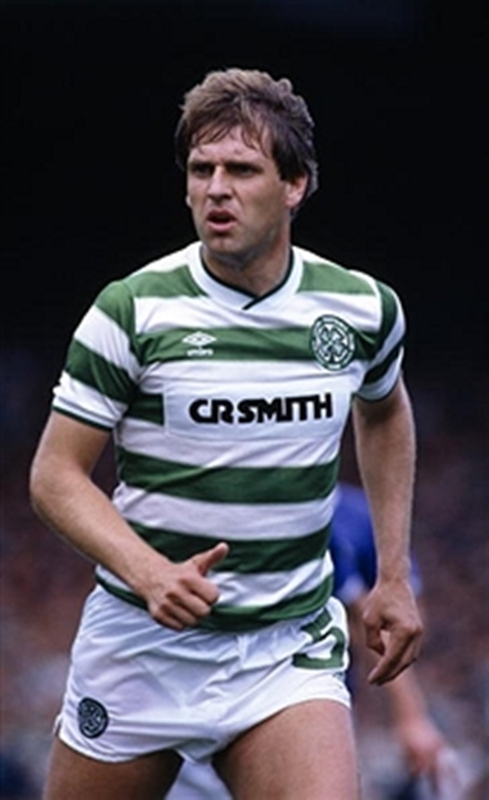 Celtic were left with a massive £440,000 cheque to play with and although there were talents in the Scottish game who could replace him such as McGarvey, Sturrock, McGhee and Pettigrew, the truth is that none of them were capable at that time of filling the great man’s boots. By September the Celtic fans were becoming restless at the lack of transfer activity and Jock Stein eventually splashed out £65,000 on Tom McAdam from Dundee United, and £25,000 for John Dowie from Fulham, for some much needed reinforcements. Both were to make their debuts in the Ibrox Old Firm game on September 10th. That game at Ibrox represents my worst experience ever as a Celtic supporter in any game against Rangers. Imagine the scene; Celtic 2-0 up at half time due to two Shuggie Edvaldsson and the entire Celtic end was lit with fervent delight during the half time break. 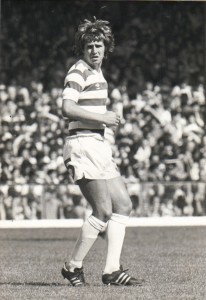 In the second half Edvaldsson was pulled back into defence to combat Derek Johnstone and Celtic lost their focal point in attack. Rangers rallied and pulled it back to 2-2 before scoring a late winner. Standing in the rain that day watching Celtic throw it away has left a mental scar which remains to this day. Oh, and Tom McAdam made a low key debut as a sub during that self same game. Tom had been a fine striker with Dumbarton and Dundee United and Arsenal were rumoured to have been interested in him when he was at Tannadice. He was mobile and was a fine header of a ball but in that first season he could not make an impression and it was felt that he didn’t score as many goals as Joe Craig and wasn’t as skilful as a young George McCluskey. When Billy McNeill took over as manager in 1978 Tom was at the crossroads of his Celtic career and Billy chose Tom as his first choice centre forward. Celtic’s early season form was excellent, with Tom amongst the goals, but things soon fizzled out and by the spring of 1979 he was no longer in the Celtic starting eleven. Fate can be a funny thing and when Celtic had an injury crisis amongst their centre backs McNeill gambled by selecting McAdam in an unusual role as centre half for the crucial run in during May 1979. 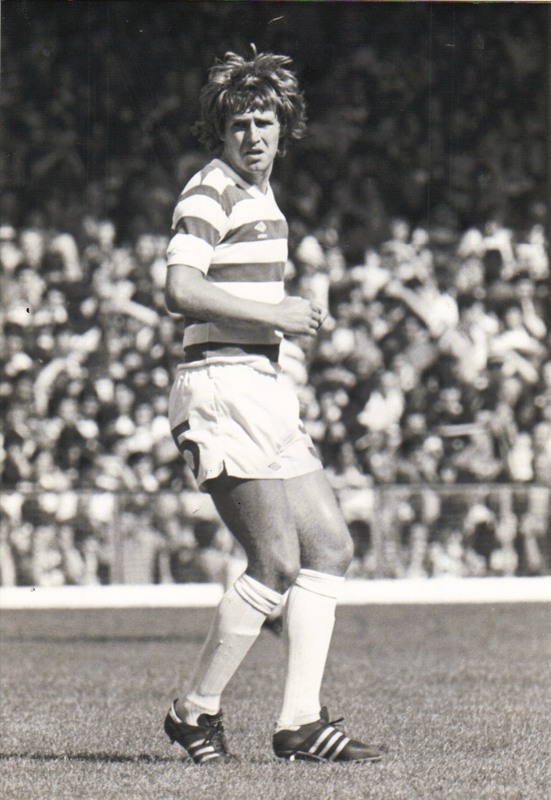 Tom’s debut at centre half came at Firhill on May 7th 1979 which was a May bank holiday Monday. With only seven minutes gone Thistle broke through the centre of the Celtic defence with ease to take the lead. The new defensive experiment was not going well but Celtic fought back to win 2-1 with Tom remaining in the team for the games leading up until the final league game against Rangers at Parkhead. Tom played that night and, simply put, became a Celtic legend as one of the 10 Celts who fought back from 0-1 down to win 4-2 and grab the title in the most dramatic fashion. Words cannot do justice to what those 10 Celtic players achieved that night and from then on Tom McAdam became a fixture in the Celtic first team. During the 1979/80 season Tom was mainly fielded at sweeper behind Roddy MacDonald at centre half. He had a fine season there and had it not been for a head injury he suffered during the defeat to Aberdeen in April then Celtic would not have lost their title to Aberdeen by a point. By the start of the 1980/81 season Tom was now centre half with Roy Aitken alongside him. The two Celts were a fine partnership at this time but there was added interest when Tom’s brother, Colin McAdam, was transferred to Rangers from Partick Thistle for a huge fee. Colin was a striker so in Old Firm games Tom would be in direct contact with his brother. 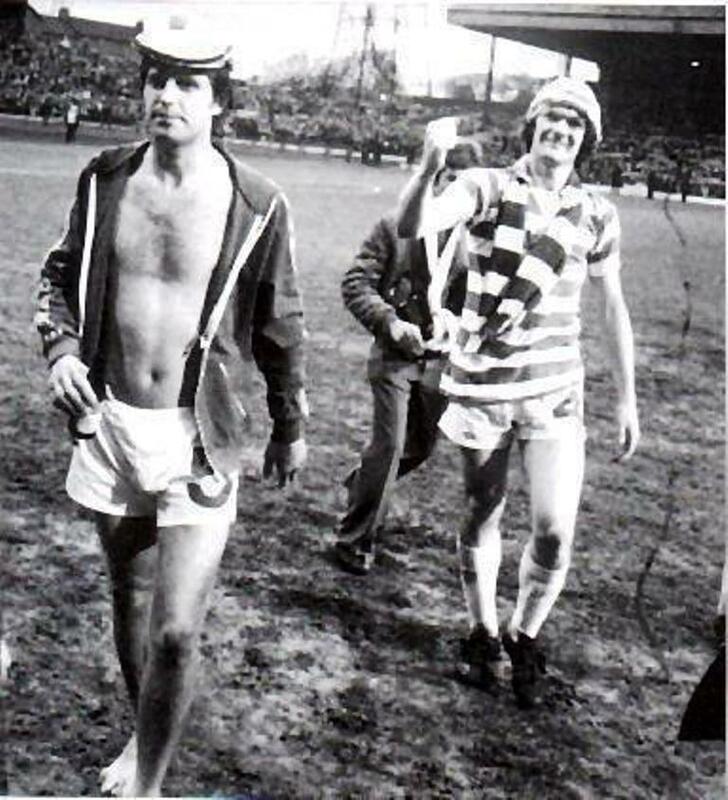 Tom did well in the battle of the McAdams and during the 3-1 Celtic win of February 1981 he could be seen pointing a threatening figure and having words with Colin after a particularly heavy challenge. Colin was an aggressive player but Tom never held back when dealing with his brother on the field of play. The newspapers loved these confrontations and when the Father of the two men was interviewed he was diplomatic enough to say that he hoped that it was a draw when his two boys came face to face on the field. There was certainly a contrast between both brothers. Colin was ungainly with a boxer’s nose and dark haired frizzy perm in stark difference to his fair headed Celtic brother. It was on the field against Rangers that Tom McAdam seemed to be at his best. He never let the Bhoys down during the battle of the big Glasgow duo and had a magnificent scoring record against Rangers especially considering that most of his games were played as a centre half. In the parlance of the modern day it is fair to describe Tom as one of the original ‘Hunskelpers’. In spring of 1982 Celtic had a shortage of forwards when Charlie Nicholas and Frank McGarvey broke their legs within a short period of each other and with a game against Rangers looming on the horizon. In desperation Billy McNeill threw Tom into the breach in his old striking role to play alongside 19 year old rookie Danny Crainie. Incredibly Celtic won 2-1 with Crainie and McAdam scoring the goals. 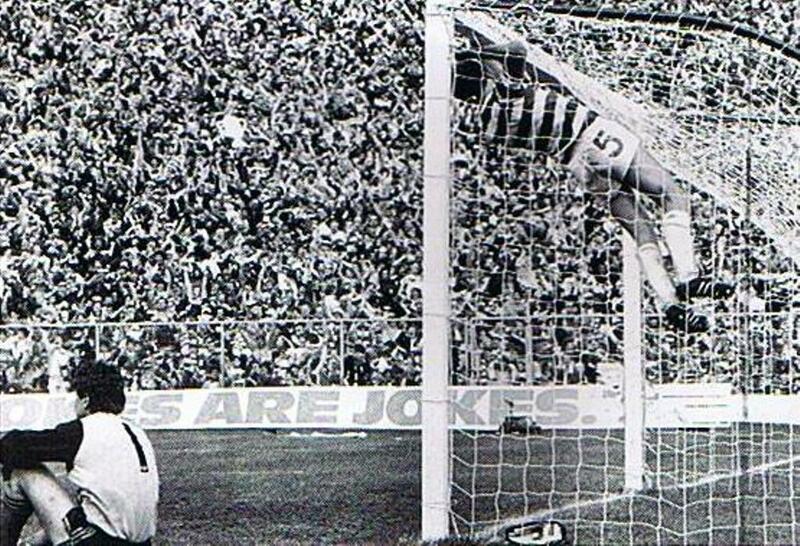 Once again the big man had excelled during the heat of the Glasgow derby and this win went a long way to helping Celtic to the 1982 League title. Tom was to face stiff opposition for the number 5 shorts during his time at Parkhead. In this period he saw off Roddy MacDonald, Willie Garner, Davie Moyes and Pierce O’Leary to retain his place. In 1985 Celtic faced Dundee United in the Scottish cup final and Tom had already suffered the heart break of missing two previous Scottish cup finals in 1980 and 1984, against Rangers and Aberdeen respectively, by being suspended on both occasions. Happily enough Tom was to play in the 1985 final and gave a splendid performance against the highly rated Dundee United striking duo of Paul Sturrock and Davie Dodds. Tom was one of Celtic’s best performers on the day and could be seen swinging joyously on the crossbar after Davie Provan’s dramatic equaliser. Celtic went on to win 2-1 and Tom McAdam now had a full set of domestic medals from his period as a Celtic player. In June 1985 he was guest of honour at the Celtic supporters association rally in the Kelvin Hall and was given a tumultuous reception by the fans who had greatly appreciated his efforts in a Celtic jersey for the previous eight years. Always a modest guy, it was great to see Tom take centre stage and take the limelight with his family and the place fairly erupted when the Scottish cup was brought on stage. 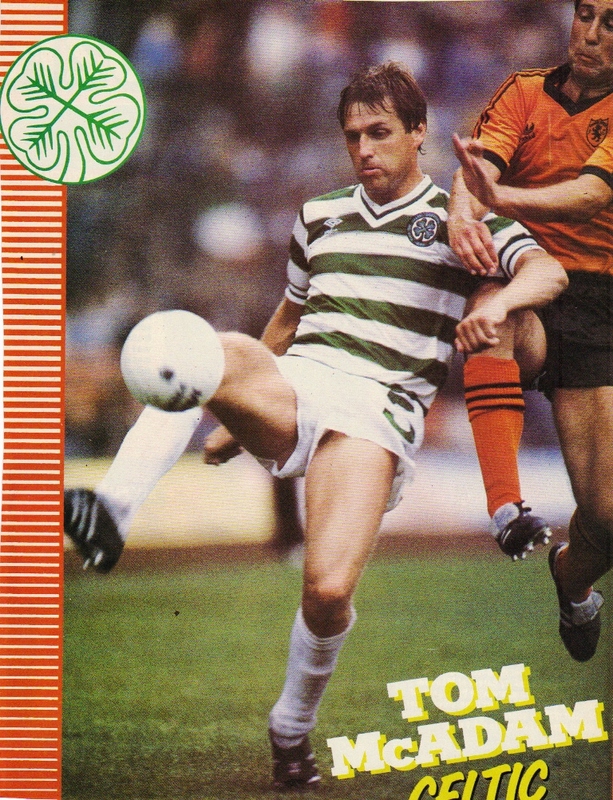 Tom’s swansong as a Celt came at Easter Road in September 1985. Celtic drew 4-4 with Hibs in a pulsating League cup quarter final tie that had had gone to extra time. Unfortunately Celtic lost narrowly on penalties with Pierce O’Leary being the Celtic offender from the spot, sending his kick high behind the goal at the Hibs’ end of the ground, ‘Towards Eddie Turnbull’s pub’ as it was described. The irony was that O’Leary had actually replaced Tom McAdam in the second half. Some of the goals Celtic lost that night were soft and Tom was now under pressure from the younger Celtic defenders such as Paul McGugan and Derek Whyte who were breaking through and he lost his place. 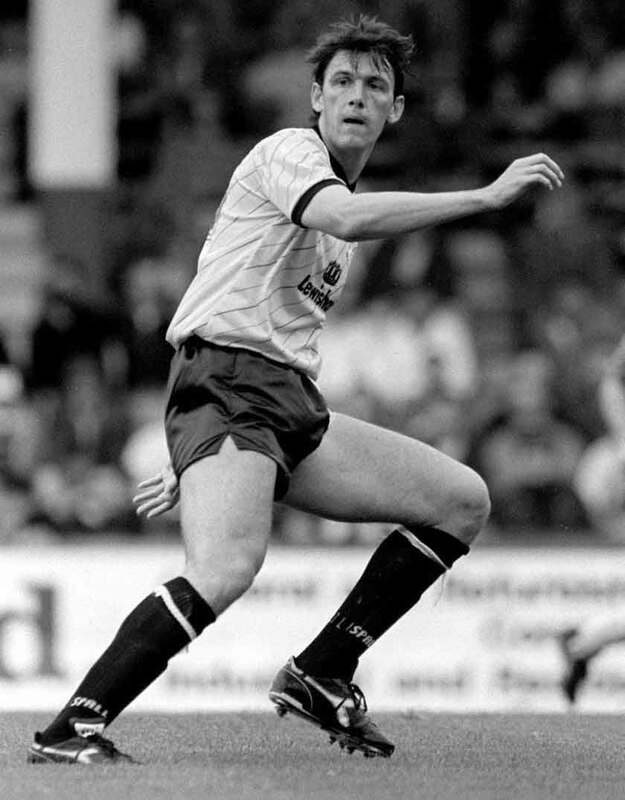 At his age Tom needed first team football and he was allowed to move on to Motherwell in March 1986 on a free transfer in view of his good service and he continued to have several fine seasons at Fir Park. Tom returned to Celtic in the 1990’s as reserve coach and during that period his son Steven was a one time fine prospect for Rangers but was not to make the grade and in his later years as coach Tom was a friendly face to be spotted by Celtic fans in the Braehead shopping centre and the Renfrew area in general. Tom McAdam may have been a surprise signing as a striker but he was to become a hugely successful Celtic defender and left Parkhead with many happy memories as well as four league medals, a Scottish cup medal and a League badge also, as testimony to his efforts in a Celtic jersey. PreviousArise Sir Walter? Or Sir Craig? Maybe Sir Neil?